When that small group of West Texas ranch women came together in 1948 to form the Girl’s Rodeo Association, few could have imagined what they would become. The WPRA today is an organization with more than 2,500 members, 1,300 sanctioned events, a tremendous finals event just for women, and a place at the biggest rodeo in the world, the Wrangler National Finals Rodeo. Today’s WPRA members owe a great deal to the ladies that paved the way for them including those pictured here (left to right) Sherry Combs Johnson, Billie McBride, Berva Dawn Taylor, Manuelita Mitchell-Woodward, Florence Youree and Wanda Kinkeade. WPRA File photo by James Cathey, taken during the GRA Fashion Show held in conjunction with the Fort Worth Stock Show. From the turn of the century to the 21st century, women’s place in the world of professional rodeo has never been better. The role of women in rodeo actually coincides with the earliest days of rodeo in the late 1800s. Struck by the success of Buffalo Bill Cody’s Wild West Show, and the crowd appeal of sharpshooter Annie Oakley, small cowtowns around the country began to organize community celebrations where competition was the underlying theme and adding women’s events helped draw a larger crowd. The women competed in events such as bronc riding, trick riding, and tie-down roping. Throughout the 1920s women had many competitive opportunities in rodeo and actually competed against men for prize money. But the world view of what women could do and what they could not do was shifting and rodeo was no exception. Within just a few years, events for women all but disappeared. There was a brief hopeful moment for women in rodeo during World War II when first Fay Kirkwood and then 1934 Madison Square Garden Bronc Riding Champion, Vaughn Krieg, organized all women’s rodeos across the country to bolster the military troops’ spirits. The first successful all-girl “entertainment” rodeo was held in Bonham, Texas, June 26-29, 1941. The event and those which followed were highly successful, but tire and gas rationing forced the curtain down on the show too soon. When the war ended, life in the rodeo arena went back to the new normal—plenty of competitive opportunities for men but not for the women. By early 1947, the Rodeo Cowboys Association (RCA) sanctioned more than 1,000 rodeos annually. Some men within the RCA didn’t want women competing in rodeos, claiming it was not ladylike. The RCA drove their point home by only offering sponsor or queen contests for the ladies with prizes rather than prize money. The Cowboys Amateur Association (CAA), originating in California in 1940, was the one group that proved beneficial to the success of women in rodeo. CAA rodeos included barrel racing, cutting, bronc riding, and roping contests for women with real prize money. In 1947 25-year-old Nancy Binford and 19-year-old Thena Mae Farr took the first steps toward securing a future for women in rodeo when they organized what would be the first ever competitive, all-girl rodeo. Held September 23-26, 1947, the rodeo was part of Amarillo’s Tri-State Fair. Despite skepticism from town officials, Binford and Farr possessed enough know-how to get the project off the ground, relying on public relations experience gained while traveling the country as rodeo queens— Binford as the Range Riders’ Sweetheart and Farr as Miss Seymour—and more than a fair bit of grit. On February 28, 1948, 38 women gathered in San Angelo, Texas, and the Girls Rodeo Association was born. The group’s primary purpose was to give women legitimate, honest opportunities to compete in rodeo events as well as to form an alliance with the RCA so women’s events could be held in conjunction with RCA-sanctioned rodeos, at the time the most organized and most lucrative rodeos being offered. In its inaugural year, the GRA had 74 members and they held 60 events across the country. The early work of the rodeo pioneers’ was just beginning. GRA members went from one professional rodeo committee to another, asking that the women be given a chance at competing in their rodeos. They offered a variety of events at the committees’ option. Many committees picked the barrel racing; it seemed a safe venue for women as they would not be wrestling with bulls or calves or riding bucking horses. As their number of approval contracts rose, the GRA leaders were finally able to establish an early agreement with the RCA in the mid-1950s. While they were finally on their way, there would be many more battles during the next five decades. In 1967 the barrel racers of the GRA realized a goal when they were included at the National Finals Rodeo, at that time being held annually in Oklahoma City. The barrel race was a fans’ favorite event – a simple speed contest, the beauty of horse and rider working together which offered a stark contrast to the rough and tumble events dominated by men. While struggling to keep its roots in the women’s rodeos alive, the GRA leaders fought for rights for its barrel racers such as electronic timers to record times, safer racing conditions, permanent markers for their patterns and better ground. Along the way they created the blueprint for modern barrel racing rules. 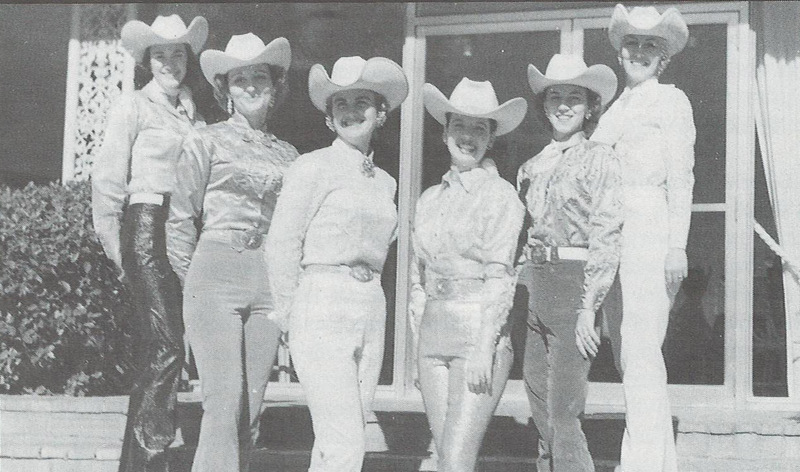 In 1981 the GRA changed its name to the Women’s Professional Rodeo Association. Several years later, the WPRA Board of Directors took a stand reminiscent of the original founders – they refused to approve a barrel race for less than equal money to what the men of the PRCA were getting at each rodeo. Though they lost many contracts with the biggest rodeos of the time, the board and members of the WPRA stood together until all committees agreed to their terms. After nearly 40 years, the women had finally achieved some measure of equality of pay. following year (1999) saw WPRA World Champion Barrel Racer Sherry Cervi set new records for earnings and win more than any other competitor, male or female, that year. 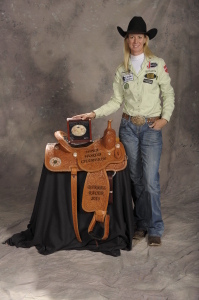 In 2013, Sherry Cervi placed in all 10 go-rounds, including three victories, and left Las Vegas with $155,899 earned inside the Thomas & Mack Center, setting a WPRA record for most money won at the NFR and collected her fourth WPRA world title with $303,317 in 2013 season earnings. In fact, the Arizona cowgirl became just the fifth cowgirl in WPRA Wrangler NFR history to have placed in each go-round. In addition to the NFR earnings record, Cervi also set a new Wrangler NFR average record rounding the pattern 10 times in 138.15 seconds, bettering the mark of 138.26 set by Jill Moody in 2010. Stingray was voted on by the top 15 WPRA contestants as the Horse with the Most Heart for 2013. Today’s cowgirls are breaking records, influencing history, and paving a wide swath for future generations. But, the benefits today’s cowgirls enjoy would not have been possible without the courageous women who roughed it out during 66 years of the association’s history before them. By refusing to tolerate injustices and unfair practices, and by standing together united, they serve to inspire future generations to acknowledge that there is no limit to what a group of cowgirls can accomplish. The WPRA . . . the past, present, and future of women in rodeo. The WPRA . . . Where the Elite Compete.